Research published in the journal Nature. 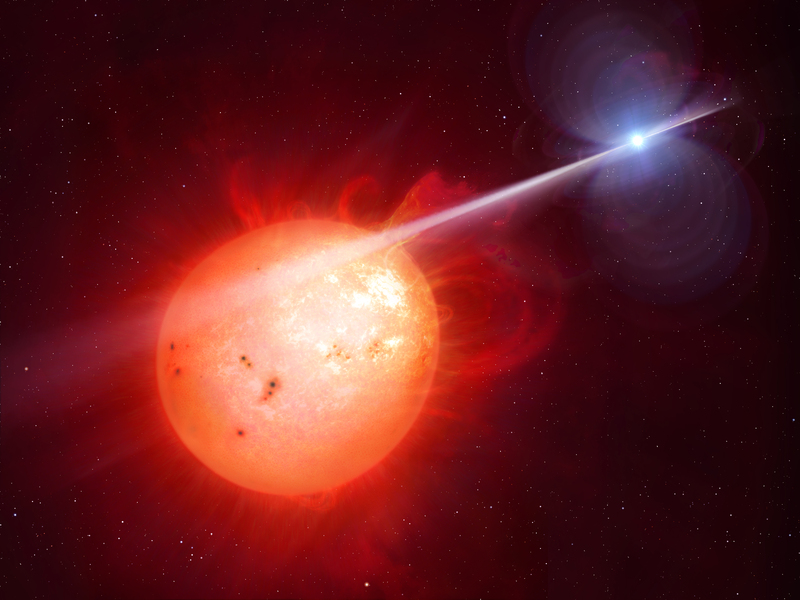 The research, A radio pulsing white dwarf binary star, is published in the journal Nature. In May last year, a group of amateur astronomers from Germany, Belgium and the UK came across a star unlike any they had ever encountered. Follow-up from a combined team of amateur and professional astronomers, led by the University of Warwick, on a multitude of telescopes from the ground and space, revealed the nature of the system. The star, AR Scorpii or AR Sco for short, lies in the constellation Scorpius, 380 light-years from Earth, a close neighbour in astronomical terms. The white dwarf in AR Sco is the size of Earth but 200,000 times more massive, and is in a 3.6 hour orbit with a cool star one third the mass of the Sun. Highly magnetic and spinning on a period just shy of two minutes, AR Sco produces lighthouse-like beams of radiation and particles, which lash across the face of the cool star, a red dwarf, and across our line-of-sight causing the entire system to brighten and fade dramatically twice every two minutes. This powerful light house effect accelerates electrons in the atmosphere of the red dwarf to close to the speed of light, an effect never observed before in similar types of binary stars. Most of the radiation seen from the system is emitted by charged particles (electrons) moving at near the speed of light. The electrons are accelerated by intense electric fields caused by the rapidly-spinning magnetic field of the white dwarf, but their primary location within the atmosphere of the cool star is a major mystery of the system. "We've known pulsing neutron stars for nearly fifty years, and some theories predicted white dwarfs could show similar behaviour. It's very exciting that we have discovered such a system, and it has been a fantastic example of amateur astronomers and academics working together." The observations underlying this research were carried out on: the William Herschel and Isaac Newton Telescope's of the Isaac Newton Group of telescopes sited on the Spanish island of La Palma in the Canaries; the European Southern Observatory's Very Large Telescope located at Cerro Paranal, Chile; the Australia Telescope Compact Array at the Paul Wild Observatory, Narrabri, Australia; the ESA/NASA Hubble Space Telescope; NASA's Swift satellite.